What do Senator Barack Obama, Senate President Emil Jones, House Speaker Mike Madigan, State Rep. Jack Franks have in common? They all opposed Choose Life license plates, dubbing the effort to raise money for adoption as "contentious." What do Bears' owner Virginia McCaskey, retired businessman Jim Finnegan, businessman Joe Walsh, now-State Senator Randy Hultgren, Rev Scott & Janet Willis and Dan Proft have in common? They led in the effort for "Choose Life" license plates. 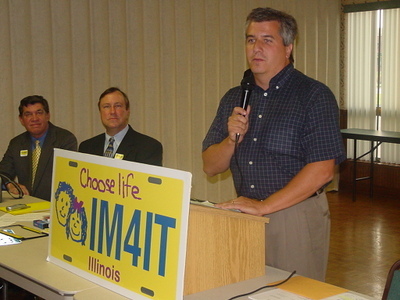 "Choose Life Illinois" license plate effort emerges, headed by Barrington retired businessman Jim Finnegan (pictured right, with GOP strategist Dan Proft). Following the lead of six other states, FInnegan builds a board of directors and advisors to encourage a specialty license plate whose proceeds will go to assist in funding adoptions. The Choose Life board of directors includes Ed and Virginia McCaskey, owners of the Chicago Bears. McCaskeys give permission and encourage supporters to gather petitions signatures at Bears' games, encouraging the Illinois General Assembly to add the speciality license plate. Momentum builds on petition signatures, eventually leading up to over 35,000 people who support Illinois offering the plates to assist in funding adoption. Rev. Scott & Janet Willis hold press conference in support of "Choose Life" license plates at the Triedstone Church in Chicago. Lawmakers who attended the press conference were Rep. Bob Biggins (R-Elmhurst), Rep. Dan Brady (R-Bloomington), Senator Chris Lauzen (R-Batavia), and Rep. Randy Hultgren (R-Wheaton). Hultgren was the sponsor of the "Choose Life" legislation in the Illinois House. 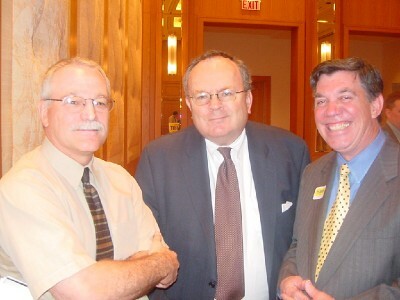 Kirk Dillard sponsored it in the Senate. "Eight and one-half years ago, Janet and I lost six of our children in a terrible van accident," Rev. Willis told the Triedstone audience. "The tragedy, the people of Illinois now know, was partially due to a licensing system in Illinois that had been abused for political greed and power." The Willises have signed onto promoting the license plates, saying, "The system of licensing is not bad. The abuse of the system is what has been so destructive. We believe that offering this 'Choose Life' specialty plate is one way this system can be cleaned up from its corrupt core and be used for good," the Illinois Leader reported. In the Senate, Senator Obama, who had just announced his bid for Democratic nomination for U.S. Senate, said he did not support the license plates. Obama told ABC Channel 7 News that day: "If we're going to be promoting one view of the abortion debate, then the other one has to be expressed as well, and we don't want license plates to suddenly become bulletin boards for political groups." He said the "Choose Life" specialty plates were "contentious." "I'd like for Senator Obama to look the Willises in the eye and tell them that this legislation promoting life is contentious," Joe Walsh, a member of the Choose Life coalition advisory board said. Indeed, later that week, the bill was heard in Obama's committee, and was voted down along party lines. Ultimately, Madigan shut down the progress of the legislation, appearing personally in one of the House committee hearings to instruct Franks to "deep six" the legislation into subcommittee. That confused and disturbed the Choose Life supporters on hand in Springfield. "You would think that Speaker Madigan, who understands the value of adoption in his own personal life, would want to advocate a way for the people of Illinois to support adoptive parents," Joe Walsh, member of the Choose Life Illinois Committee told Illinois Leader. "We have to make it work. Its not supposed to be difficult to adopt. We need to add support to birth mothers." In the Senate State Government committee, sponsor State Senator Kirk Dillard (R-Westmont) was unable to get more than a committee party line vote. Rev. Scott Willis spoke on behalf of the specialty plates, asking that the committee use the specialty plates as "one way this system could be cleaned up from its corrupt core, and be used for good." All four Republican committee members supported the Choose Life plates and all six of the Democrats voted against the legislation. The Republican members of the Senate State Government Committee were: Senators Dale A. Righter (Minority Spokesperson), Christine Radogno, Dave Syverson, and Kathleen L. Wojcik. The Democratic members of the Senate State Government Committee were: Senators Barack Obama (Chairperson) Mattie Hunter (Vice-Chairpers on), M. Maggie Crotty, Susan Garrett, Iris Y. Martinez, Carol Ronen, and Jeffrey M. Schoenberg. Pictured right: A rally was held in Effingham on behalf of the Choose Life effort featured then- GOP candidate for State Rep David Reis. 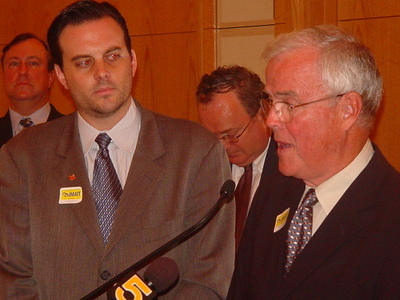 Reis (right) supported the effort in his first bid for State House in fall 2004 campaign. Supporters Dan Gura and Joe Walsh are to Reis' left. Despite the resistance from Attorney General Lisa Madigan's attempt to dismiss the challenge, the court ruled the case would be continued. Federal district court Judge Coar agrees with plaintiffs, and the state of Illinois is ordered to make Choose Life license plates available to Illinois residents. The extra funds will be directed toward adoption promotion. Key opponents: State Rep. Jack Franks, State Senator Barack Obama, State Rep. Mike Madigan and Senate President Emil Jones.